Fractions are the life blood of mathematics. As blood is everywhere in the body, exactly the same way fractions are everywhere in mathematics. They are learned in arithmetic section, they are used in algebra, statistics, geometry, trigonometry, calculus and everywhere else in mathematics. This site is all about the fractions. You can find lessons and worksheets on all topics on fractions from KG to Grade 8. 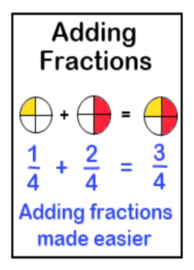 This page contains beginner level fractions lessons and worksheets for grade one to grade five kids. Once kids start to realize the need of fractions, what actually fractions are and how to represent them; the next level is to introduce equivalent fractions to them. This page contains some cool equivalent fraction worksheets and lessons for kids. Similar to whole numbers, fractions can be lager or smaller too. This page is to teach kids how to compare two or more fractions. Most often, there are three types of problems on comparing; first, when the denominators are same, second when the numerators are same and finally when the numerators as well as the denominators are not same. Reducing a fraction into its lowest terms needs sound knowledge of basic multiplication, division and greatest common factor. So this skill is taught in late grade four or in grade five. This is the key skill which is used in fractions application in higher grades too. There are three main types of fractions; proper, improper and mixed numbers. 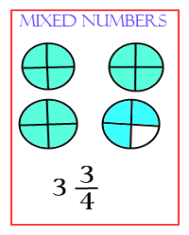 This page gives in depth information, lessons and worksheets on mixed numbers. Sometimes fifth grade students can learn adding fractions, but this skill is taught in grade six. There are two types of addition; one, adding fractions with like denominators and secondly adding fractions with unlike denominators. The later is taught through grades six to grade eight. 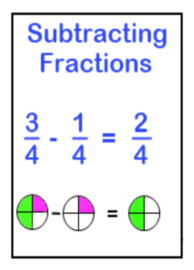 Subtracting fractions is very similar to adding fractions and also of two types. Students in grade 6 start to learn subtracting fractions with same denominators and keep learning through grades seven and eight till they learn how to subtract fractions with different denominators. Lot of students in grade 7 have difficulty on how to multiply fractions, but it easier to multiply fractions as compared to their addition or subtraction. 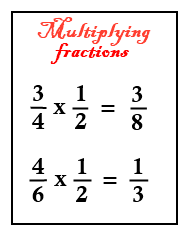 Visit this page if your kids really want to learn how to multiply fractions. 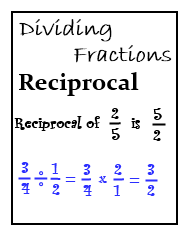 Dividing fractions is the final stage of learning fractions. Once students learn how to divide fractions, they are ready to apply the knowledge of fractions in other areas of math, such as algebra, trigonometry and geometry. 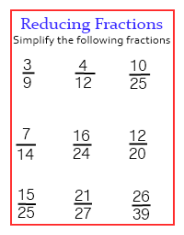 Now a days many math websites contain fractions worksheets to learn and practice this math topic. This site's name is fractions worksheets and thats what you can expect from it. Fractions are all around us! Yes, we have fractions all over the places. But when it comes to the knowledge of fractions, then 4 out of 5 people don't acknowledge their presence. Look in the kitchen; recipes, slices of pizza or a pie are very good examples of fractions around us. Coins are fractions of one dollar. We use fractions to tell time. At work places we deal with hundreds types of fractions in the form of measuring tape, recipes for restaurant foods, quoting a price for a customer, workers' hours of work, calculating discount and of course gasoline prices go up or down by fractions of dollars. Then, why everybody hate fractions? One reason may be that fractions can be in many forms. For example; decimals can be fractions, when we divide a number by another it makes a fraction, percentages and ration can be fractions. So, students may get confused that what actually fractions are? 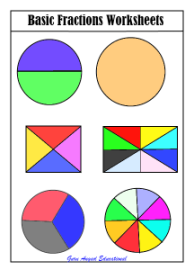 In simple language; fractions are parts of a whole or a group. For example, one apple, you ate half; now half you ate and the left over half are both fractions. There is something wrong in the way we teach or learn fractions. 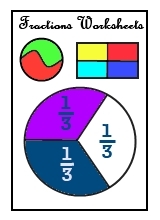 This site is developed to put a little effort to make fractions learning and teaching easy. You can find some art based fraction instructions here. Fractions worksheets and lessons on this site can help students get better at fractions. We have splitted this site into various sections depending upon the levels in the study of the fractions. Obviously, the basic levels are at the beginning of the site. Site builds over the basic concepts as the students upgrade into the higher grades. Each page starts with lessons on that topic and then followed by fraction worksheets. You can navigate this site two ways. First, just follow the navigation bar menus and choose your topic you want to learn. Second method is to use the worksheets pictures given below, which are sorted according to the grade levels, kids should learn the fractions. The grades levels can be little different based on your country but you will find every single topic on fractions here, independent of your country. This section contains the models of our worksheets and lessons. You know gems are never found in garbage or sand, but we have to dig or dive hard to find them. Similarly you have to dig this site hard if you are willing to find some real gems to learn or teach fractions. You can find out links to all pages of the site. Every single worksheet and lesson have more than one links to get it. This site have free fractions worksheets, that are capable of making your kids super smart in math. 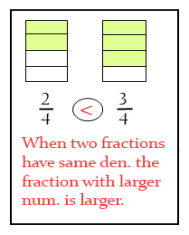 You can print our very powerful lessons on fractions to address main problems faced by kids, while they learn fractions. Give our fractions worksheets a try and you will come back for more, as these fraction lessons and worksheets are proven to make a difference in students marks and grades. Click the red link, if you want to know ===>> How to use this site? If you are a math teacher, tutor, a parent or a student; I understand your needs as our staff have great experience being all of these. 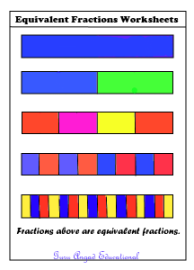 This site "fractions worksheets"will talk about fractions only. Our team will put all of its experience in math teaching, to work for all of your teaching and learning needs, free of cost. Before we created our own math content, we use to go online in the search for quality fraction worksheets for our students. But only a few sites are there with free fraction worksheets and lessons for kids. We use to subscribe to get access to quality math content. But once we start to create our own content on computer, it changed the way we use to teach our kids. Now, the same content we are sharing at this site. Why We Do It For Free? We do it for free because we believe in sharing, and education grows by sharing. What we see at our tuition centre, that most kids struggle in math. The main reason we've found is the lack of basic knowledge in the subject. In our dealings with students for years, we've found out that fractions are one of the most important basic concepts in math and students have to learn them from the core to succeed in math. We've tested it with our students and found that students with good understanding of fractions, scored very good marks in overall math in every grade. This site gives all the kids an opportunity to learn and practice fractions by printing off free fractions worksheets and lessons for all grades.